This Valentine’s Day, invite your lover over for fun and chocolate with this silky Milk Chocolate Truffle Cream Pie from world-famous chocolatier, Ghirardelli. Chocolate is the ultimate food of love – one slice will put you both in the mmmmm mood! this chocolate confection while you fall head over heels for eachother! 8-inch pie plate, or 4 individual custard cups, or fancy stemmed sherbet glasses. hours or until very cold. Beat until thick and creamy. Spread into crust. Chill 1 hour. 3. 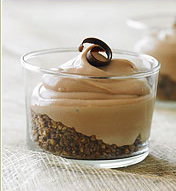 Garnish with additional whipped cream around the edges and generously sprinkle with grated milk chocolate, if desired.